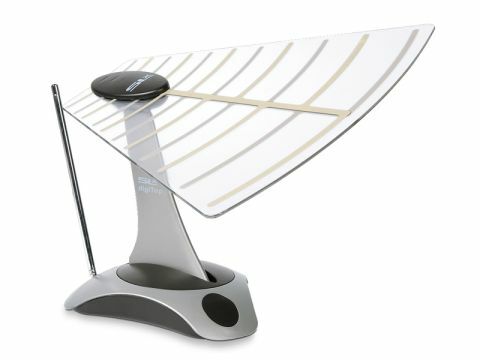 Very much out of the old school style of indoor TV aerial design, the 27768R has a translucent fin coupled with telescopic VHF antenna rods. The latter can be used for picking up radio signals so long as your receiving equipment has a coaxial input. Assembling the aerial is a one-step process whereby the column supporting the UHF antenna blade is slid into two slots on the base until it clicks into position. A diagram in the instruction leaflet unambiguously shows how to do it. There's no amplifier included, and hence no power cord, which means greater freedom in positioning although this is tempered by the fact that at just over 1m long the aerial cord is a bit short. To aid tuning, the base of the column can be rotated through 180° and the blade can be positioned horizontally, vertically or any angle in between. When adjusting the blade the aerial feels a tad unsteady especially as the column rocks about, but overall it sits steadily enough on a flat surface. Described on the box as a 'high performance' aerial, the warning about a strong signal being needed is buried in the instructions leaflet. Despite lots of adjusting, reception in our test home was very poor with no channels picked up except BBC1 and BBC2, which were fine.